Who doesn't love a Faustian deal? ...Fictionally, of course. 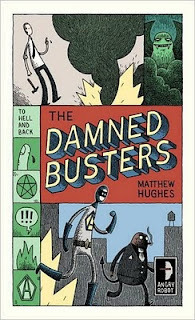 The Damned Busters is a fun subversion of the trope: Chesney Arnstruther is constructing a poker table when he hits his thumb. While mentally swearing, speaking nonsense. Which turns out to be precisely the right incantation to summon a demon - complete with Faustian contract and pen. Unfortunately, Chesney wants to keep his soul for just a bit longer: and when the demon returns, unsatisfied, it's behind on its molten-gold-to-misers quota - and the conflict escalates. Soon, the demons of Hell are on strike, and in the process of negotiating a settlement between Satan and minions, Chesney manages to grab a perk: the demon Xaphan is at his call for two hours every day to fight crime. (Unfortunately, the last time he visited Earth was during Prohibition - though he makes a very good gangster). All in all, The Damned Busters is a very un-adult urban comic fantasy: something rare in modern genre, and definitely to be savoured! It's also quite a short novel (again, a rarity), and can be easily enjoyed without too much involvement: perfect for a bus or train read. It has its flaws - it doesn't take itself seriously enough for any real drama, which can be a good thing, and it's not as amusing as some of the masters - but definitely worth picking up. Great review! We both got a kick out of it! I do love my dark fantasy, and this was a very refreshing change of pace. Thank you for the review. I'm actually hopping by by Follow Friday Hop. Since your post is not up yet, I added my comment here.I'm a new follower, GFC inga.